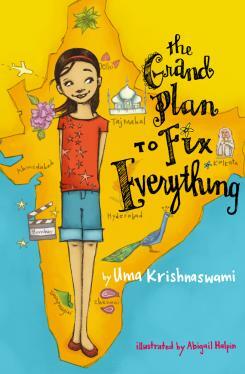 The Grand Plan to Fix Everything by Uma Krishnaswami. Atheneum Books for Young Readers, 2011. Currently available. Face Value: This cover is dynamite. The illustrator, Abigail Halpin, created this vivid depiction of Dini’s new setting – her new home in India. I love the bright colors, Dini’s sweet but smart attitude, and the gorgeous typography of the title. The best part is that the cover also includes clues as to Dini’s struggles. If you flip the book over, you follow the flight path from Maryland to India and you get to see Maddie standing there with a phone. This cover establishes the central conflict of the story without spoiling any of the fun. I would love to see more of this kind of cover on the shelves. Does it break the slate? Yes! Dini is Slatebreaking because she is acutely aware of the level of agency she has in her world. She knows that her parents are in charge and that they don’t take her seriously, so she takes charge in her own way and creatively changes her circumstances. Dini is also a keen observer of human behavior. She pays much more attention to the world than the adults around her, and her observations lead to insights that often surprise the grown ups. Dini reminded me that I should never, ever, underestimate a young person. Who would we give it to? Girls whose families have recently relocated. Moving is tough, and if any character will comfort a girl who is trying to fit in a new place, Dini will. Review: Dini and her friend Maddie are two peas in a pod. The girls live in Bethesda Maryland and are the best of friends. They spend all of their time together watching Bollywood films starring their most favorite actress in all of the world, the talented and stunning Dolly Singh. Then the unthinkable happens. Dini’s parents announce that they are moving to India for two years so that her mother can work in a community clinic there. Dini and Maddie are heartbroken. How can they sustain their friendship with oceans and thousands of miles between them? Desperate to salvage her friendship, Dini decides that she must find Dolly Singh once she gets to India so that she can impress Maddie with a dazzling story of their encounter. Although the reader can see from miles away that Dini’s new plan has its faults, it is still enjoyable to watch everything go to pieces. Not in a schadenfreude sort of way, though. I still liked Dini and wanted her to succeed, but it was hilarious to the bumps in the road unfold. Each time, Dini regrouped and generated a new idea to bring everyone together. There were moments when Dini became mopey and sad after a minor obstacle, but her ability to get back in charge is admirable. I loved her resiliency as a character. When one solution failed, Dini brainstormed another one. Persistence is a Slatebreaking trait that gets far too little recognition, and Dini is a perfect example of persistence. “Nandu!” Dad frowns at her. He is embarrassed by her directness, no doubt, but she doesn’t care. If she isn’t direct, no one is going to be. It’s very clear that direct talking is precisely what is needed at this moment. Dini also understands that adults don’t “get” kids sometimes, and that there are moments when she needs to challenge that dynamic and moments when she just has to grin and bear it. One of my favorite moments happens when her father tries to comfort her: “Dad puts his hand on Dini’s head and rumples her hair. Maybe one day she will pick the perfect moment to tell him that he needs to stop doing that.” Dini frequently contemplates the annoyances of living with adults. There are tons of these little gems that young readers will love. Dini is not the only character to love. There is a hilarious cast of characters who add to the vibrant atmosphere of Swapnagiri. For a small town, there is a surprising abundance of goofy and dramatic people. Dini meets mischievous monkeys, a mail carrier who also loves Bollywood films, and a bakery owner who is in a long-term feud with the monkeys. Everyone comes together in one of the wackiest climaxes I have ever read. It was a shade unbelievable, but once I learned to relax and just let Krishnaswami take me along into this chaotic and zany world, it was great fun. Sometimes believability doesn’t need to be a priority. Krishnaswami has a quirky writing style that I initially found difficult to absorb. I found the descriptive passages to feel stilted. I really think this book would have felt more natural if it was written from Dini’s perspective in first person POV. However, it was worth any awkwardness in writing style to read about Dini and her adventures in Swapnagiri. Krishnaswami has captured the spirit of age eleven in her writing, which is absolutely admirable. Eleven-year-olds still have some naiveté, yet they also are getting too old for most things that younger kids enjoy. Dini is in this wonderful limbo between childhood and adolescence. This is the perfect book for those readers who need something transitional to get them through their own times of major life change. This entry was posted in Middle Grade, Reviews and tagged Bollywood, Family, Friendship, India, Middle Grade, moving, preteens. Bookmark the permalink.